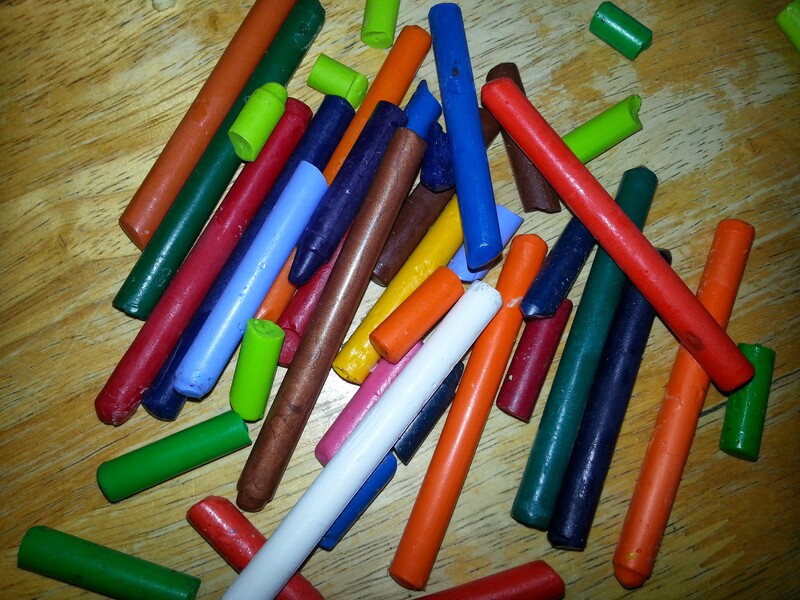 Sitting here on Sunday morning drinking my coffee and peeling wrappers off of old crayons to try to engage the kids in one of those “melt old crayons down into new shapes” crafts. I think I have little heart- and star-shaped tins I can use for it. Right now they are out with my husband visiting my mother-in-law, but maybe when they come back they will want to do it. My plan for my alone time is to write for a little, then go out to the garage and finish painting my dresser knobs. I spent some time yesterday organizing and cleaning out the garage after it occurred to me that it could be a good painting/crafting spot for me. Most of our tools/sports equipment/etc. is stored around the perimeter of the garage, up in the loft area, or in our second garage (a smaller, more rundown structure). I have that tall dresser that I moved out there to paint — it could hold supplies. Right now most of my crafty stuff is stashed away on the third floor and somewhat hard to get to. There is enough room for a small table. Not like I’m the queen of crafts. I have some scissors that make patterns, a paper cutter, some random bags of colored paper squares, some ribbon. My mom just gave me some mini brown kraft bags. Mostly I just hoard random stuff and then once in a while try to do something with it. One year I made my own Christmas cards. If we have a Halloween party, maybe I’ll make some decorations or goody bags. I don’t really have the attention to detail needed to make pretty crafts, or the stamina. “Good enough” is my motto. 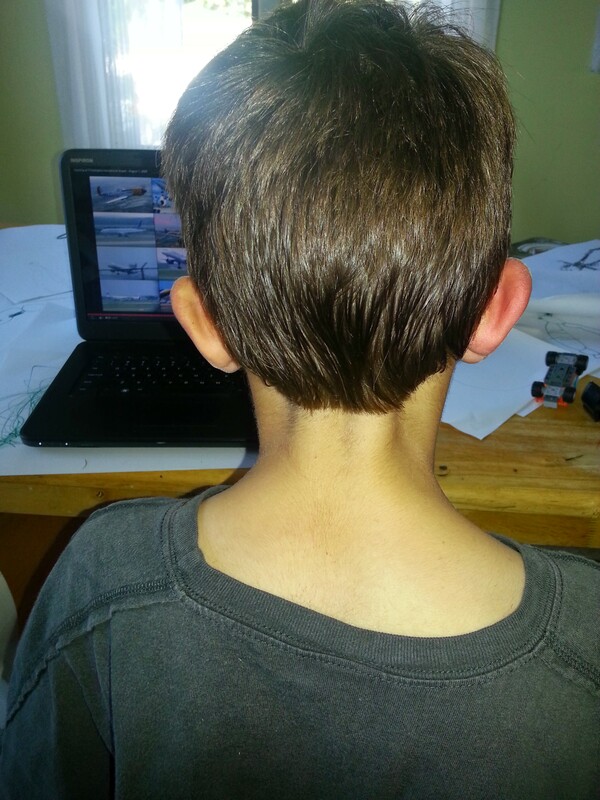 Speaking of attention to detail, I was really excited Friday because I attempted to cut the kids’ hair myself. I’ve been thinking about this for a while, reading up on it, looking at YouTube videos. But I would always chicken out and take them to the Kids’ Kuts place nearby and drop about $45 for the three of them. I don’t consider myself good with hair. I’ve been battling with my own super thick hair for years. I’ve had a couple bad experiences with trying to dye my own hair. Even when I take the kids to the haircut place, I have a hard time articulating what I want their hair to look like. Nevertheless. On Friday, something just snapped: I gathered the razor and attachments that my husband uses for manscaping, scissors, a spray bottle, and a towel; bribed the kids with cupcakes my mom had sent over; and started snipping. Sometimes you just have to do it and learn in the doing. When my husband came home, he freaked out and said they looked terrible. (He is still traumatized by the haircuts his mother gave him back in the day.) I know they don’t look great, but I just feel so empowered. I know for sure now that I can do it myself, with a little more practice and instruction. That’s a money savings and a time savings. I don’t have a philosophical objection (to quote Pres. Obama) to paying for haircuts: I like to support small businesses like that; I like getting out of the house and chatting with the friendly gal at Kids’ Kuts. But it’s nice to know I don’t have to. Yesterday, we took the kids to the annual Fall Festival held at our park. Basically all the schools run booths with different activities and crafts, and there are pony rides and a hayride. Our school does a cupcake-decorating booth, so I made cupcakes that morning to bring. I used this recipe, since I didn’t have any box mixes. Easy and good, but I forgot that from-scratch cupcakes tend to overflow the cups and then stick to the pan, if you don’t spray the top of the pan with cooking spray. So I had to try to saw the tops free with a knife, and ended up delivering a raggedy-looking bunch of cupcakes. One of those details I wasn’t paying attention to. I need to go back and scrawl one of my angry notes on the recipe print-out (“Spray pan, these stick to top!!!!!!”). This coming week looks pretty quiet. I don’t see any appointments on the calendar. I’d like to squeeze in some baking today — the practice of having some fresh-baked semi-healthy goodies around for snacks and to pack in lunches has worked out well and kept me from buying similar, processed stuff. Christmas is starting to seem close. Eeek.